We're so pleased that so many of our customers have taken the time to tell us what they think of VITILIGLOW™. Thank you for sharing your experience of using VITILIGLOW™ and for allowing us to share it on the website. Please email info@vitiliglow.co.uk to tell us what you think! Just gets better and better. Completely life changing for me. Thanks Polly. After having vitiligo for 22 years and trying every fake tan possible and still not being happy with the results I ordered a small bottle of vitiliglow to try and I have got to say it is absolutely fantastic. It has given me so much confidence to go out with short sleeves and not worry about people staring, I'm a phlebotomist so have to wear and change gloves in my job and the vitiliglow doesn't rub off on my hands which is another bonus to this fantastic product, will definitely be ordering again. I have used this product before but couldn't find the right shade for me. However with the wider range of colours tan dark is perfect. I'm so happy that it covers really well and my confidence has returned to expose my legs which have large white patches all over the shins. It is so easy to apply and spreads well. Once on it doesn't rub off onto your clothes or wash off in the sea or pool. If you get the right shade I can strongly recommend it. Thank you so much! Quick delivery. Happy with the formula, seems to be different to my last order which was only 2 months apart. It feels like it goes on smoother and it is not as dry, almost as if there is a little bit of oil in the mixture. I like it and like how it feels on my skin when I'm applying it. 5 stars product. Perfect finishing on skin, really good solution. 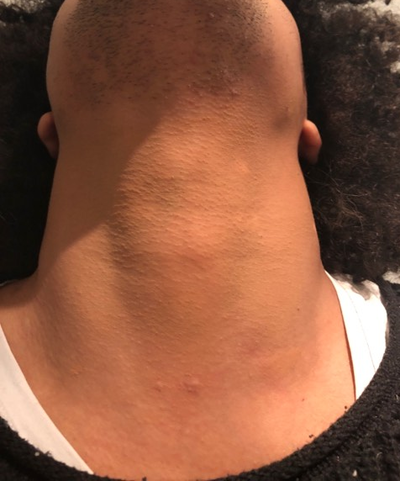 I've been using this product for a while and with a man with extensive vitiligo, it has been a life saver for me in the work place. Thanks so much. ​Vitiliglow has given back my confidence! It's like dignity in a bottle! And doesn't smear all over the place like prior camouflage I have tried. Colour matching is always a challenge but with what is available, it's more than suitable. Thank you! Vitiliglow has changed my life. I don't have to worry when the sun comes out anymore and can go on holiday again. I do not have to use fake tans which do not work. It is ingenious and my life so much better for Vitiliglow. Thank you so much for this wonderful product. ​I received my product and I think it is awesome and it helps me with my confidence thank you. ​Long-lasting make up with a very high coverage. I am very satisfied! ​New formula is really light and the staying power is amazing. Once you've removed the excess after allowing it to dry, it really stays on and doesn't rub off on clothes, nor does it wear off after a few hours. Now that I'm back in Spain, I'm finding it nice and light and I don't suffer from 'makeup sweat' even when it's hot. All in all, I'm very grateful to Polly for her advice and for the efforts to get it to me before I left the UK. 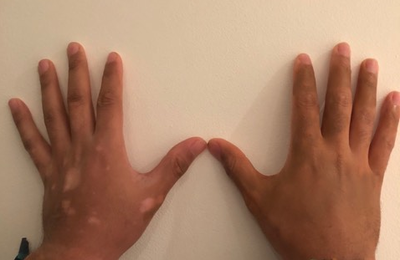 The quality of the product and its absolutely suitability for vitiligo cover is due to Polly's perseverance with perfecting the formula of this product. As she has vitiligo herself she knows exactly the issues that we have and what we need from a cover makeup. It's nice and matte, not shiny and it goes on a dream - just moisturise first and then go for it. The range of colours is superb and I can't say enough good things about the product. It's affordable to test out which colours work best for you, it costs less than many ordinary make up brand foundations. I purchased the vitiliglow prep/remover at the same time as the medium shade vitiliglow. Great product does exactly what it says on the bottle. Thank you. Love it! Really don't know what I'd do without it. Thank you so much! I love this product, it has given me a new lease of life. Love mine, so happy not to have white feet anymore. ​Vitiliglow tan shade has blended in really well with my skin tone so you can't see the patches on my neck now. I think it's a great product! Thank you for giving us back our confidence stepping outside and not covering our skin with layers of clothing. Thank you for developing this great product. I'm very happy with it and it has made me feel much more confident about my appearance. Very happy with the new formulation, thank you. It's fantastic Polly well done. I have a drawer ful of fake tan which is going in the bin! I recently received a smaller bottle of Vitiliglow and I couldn’t be happier. As a man with Vitiligo for many years I’ve had to resort to using various makeup products which did not match well and would rub off. Finally! A great product! Thanks so much as I’ve been searching for something like this for so many years. ​I have just received my bottle of the new formula Vitiliglow in Medium. It's fabulous! I had a few problems with the old formula but, the new one goes on really smoothly, it's got a lovely silky texture & blends my white patches in very easily. My hands are almost white & Vitiliglow covered them well blending with the remaining pigmented patches on my arms. I'm delighted with the new Vitiliglow it will certainly help my confidence. The new bottle is also much better, it applies easily & doesn’t "squirt" like the previous bottle. A great product Polly, thank you for your perseverance & for getting this fabulous product out to me. ​I'm happy to say that the new Vitiliglow is an improvement on the previous product and stays on well. Wow! Just received my new Vitiliglow and I LOVE IT!!!! Just had a quick go at putting it on my hands and it’s AMAZING!! THANK YOU POLLY!!! ​The package arrived a short while ago and I've just tried covering my hand which is completely white apart from a pigmented patch on my thumb! The new product is amazing, it's gone on really smoothly (not chalky) and the colour is much more natural. I will be able to go to my birthday celebration with a lot more confidence now....thank you so so much. I may even brace a lower cut top as I can cover my white chest! I would like to say congratulations for the amazing makeup you have developed. You are indeed a true human being! Even though I am dark skin person, but anyway I go ahead and ordered the Tan and Medium Shade. You may wonder why I have ordered this product when I have a dark skin. The answer is: I wanted to test the quality of the product if it is true what you said: "Rub" Proof! Yes, you are 100% correct. I applied the make up on my hand and it has dried quickly and has "Flawless" look. You should be proud of yourself. I hope the "Ebony" shade will have the same quality and looking forward to trying the "Ebony" shade. I have no words to thank you for your effort to develop such an amazing product. It is an A+++ product. I hope one day your company will be the most successful company in the world and last for generations without compromising the quality of the product. Received my new tan Vitiliglow this morning, it's a fantastic cover,really pleased with the cover especially with the party season looming up quickly , normally in the winter I have to wear long sleeved party dresses - no more. Thank you so much for this product. I have received my Vitiliglow and am very pleased with my first attempt. Have searched high and dry for a product that works. So, thank you for your innovation. I’ve been using the medium shade for the last week and I’m so pleased. Like many others have already said, it’s great to just apply and get on with the rest of your day with no rubbing off. Very happy with the new formulation, thank you!!!! There is no product like yours on the market! Wow! Just received my new Vitiliglow and I LOVE IT!!!! Just had a quick go at putting it on my hands and its AMAZING!! THANK YOU POLLY!!! I'm starting my second week of vacation in Portugal, on the beach every day with medium light. I haven't felt so good with myself on the beach for 10 years... THANK YOU so very much, your product is life changing for me! Not too bad for a first attempt! Was very gentle with the pump and pressed the top gently whilst in an upright position into a small plastic tub already containing a little moisturiser. Applied with a combination of brush and sponge and finished off with my own makeup powder. I got the medium colour as I had areas of tanned skin that had not faded. Thanks again for persevering with development of Vitiliglow. I love love love Vitliglow! It’s the best product ever - I went to the beach and was complimented about my nice tan, not asked about my white patches! Thank you so much again for making these. It’s amazing. I could have done a better job by adding another layer of product, however this works well enough for my purposes. The first time I used it, I applied the product with my hands, the second time (in attached photo) I used a brush. I think I prefer applying it by hand, it gives a more natural finish. Well all I can say is - Vitiliglow is a brilliant product. I have watched your you tube video and also found this very interesting too. The pump is quite powerful when you first use it but you get used to it. Thank you for such a great product - I am so happy, I expect you have made a lot of other people very happy too. ​I didn't want to rush to comment on my Vitiliglow until I had used it a few times and got the hang of applying it. I am really, really pleased with it. 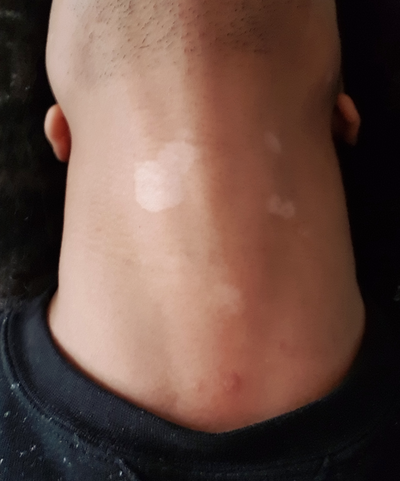 I don't have many white patches when compared to others with Vitiligo but mine are enough to make me feel embarrassed come summer time. This is by far the best product I have tried to cover my white patches. Once applied they aren't completely invisible but you have to look petty hard to spot them. I love the fact that it is natural looking and I forget how good it is until I wash it off. It's been a long time since I've had the courage to wear open sandals/flip flops in the summer, since I've been using my Vitiliglow I am living in them. I ordered the medium light shade which is fine for now but once you have your new stocks I will order the the darker shade and try mixing them together for use when on holidays. I found the pump to be a bit fierce but have mastered it now and will try your tip about releasing the top first. I have been applying with a sponge and dabbing it onto my white patches then blending over the edges but tomorrow I will try mixing it with moisturiser. Many thanks for the product and the tips for application are very, very welcome. I have been trying the light version, I am getting better at applying it and your tips are very helpful, I started off with too much. I really like the effect when I get it right. Much better than cameo make up. Can you let know when you get the next batch in as I would like to try the next darker shade, the medium, as that probably will be a better match. Thanks for developing the product, it is really good and makes a big difference, especially for me in the summer.